There’s been a ton of discussion, all over the place, about ALA Council and ALA voting turnout and the membership feeling invested in their representatives. I’d kind of like to approach this from a different angle, though. Rather than talking about the size of Council, maybe we should talk about how we elect them—and, in turn, everyone else whose job it is to represent us in ALA. It’s possible that, when we cast our votes, we aren’t (collectively) getting what we want. And since I just happen to know (actually, to have married) someone really knowledgeable about voting methods, I thought I would ask him to explain how we might do this better. So I bring you this guest post by Dale Sheldon-Hess, who blogs extensively about these issues at The Least of All Evils. Let’s break voting down. You have 1) a group of mutually-exclusive options to choose from. We don’t have to be talking about candidates for office; we could be deciding between different pizza toppings, or names for your new band. You have 2) a group of people with opinions about those options. Finally, you have 3) a system which takes those opinions and uses them select one of the options. Actually, you have a whole lot of different systems, and you get to choose one. Your system could be “pick one of the options at random.” That’s not a good system, since you could end up with an option that everyone hates. Or, you could pick one of the people at random, and let them choose. That’s a little better—you know you’ve picked an option that at least one person thinks is the best—but what if everyone else thinks they’re wrong? Shouldn’t we consider everyone’s opinions? To apply this (I’m thinking approval, rather than score, voting) to ALA, we would do our Council elections exactly the same way we do now, except we’d remove the limit of 33 votes (or 34 some years). This would have two benefits: people would not feel like they were “wasting” their votes by voting for fewer than 33 candidates—they could vote just for the people they really want, without guilt. That alone would remove noise from the system. Second, it would allow people who approve of more than 33 of the candidates the opportunity to show their support. We could also apply it to all of our other elections. 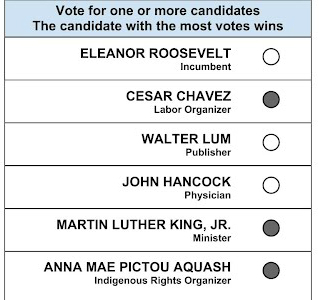 We could allow more than two people to run for ALA President at once and be assured of a fair outcome of the election (which is not a guarantee with our current, plurality-based voting). The divisions and roundtables with three- and four-way elections could also be guaranteed a fair outcome. And for the many one- and two-candidate elections, there would be no change. It’s a really easy way to make ALA better. As a bonus, there’s an Indiegogo campaign to get more attention for Approval Voting, via a snazzy video. Check out the page (which has a bunch of information about approval voting, in addition to a not-snazzy video). If you’ve got a couple of dollars, I know they’d appreciate the help. Next Post What makes one a librarian? I appreciate the effort that went into this article. And I have a lot of respect for Coral and what she is trying to do. But the issue with the ALA Council elections isn’t about process, it’s simply that there are too many candidates. When I looked at the ballot for ALA Council, I was stunned to see that it has a whopping 76 candidates for 33 seats. The accompanying candidate’s statement booklet is over 150 pages long. And that is only for 1/3 of the total at-large Council contingent! Each ALA voter is expected to evaluate, select and track one hundred representatives. Not even the U.S. Congress in all its dysfunction expects voters to evaluate, track, and hold accountable 100 representatives at the ballot box. There’s a reason why each U.S. voter only votes for one House seat and two Senate seats — to “guard against the confusion of a multitude,” as James Madison wrote in the Federalist papers. What’s more, no other professional association of ALA’s size even comes close to having 100 at-large reps in its governing body. All other associations have less than 20 general governance reps elected at-large. Many have none. Check out this chart of similarly sized professional associations with structures and missions similar to ALA’s: http://bit.ly/ALAcouncil-comparison. Why does ALA have so many at-large council seats? Why are ALA’s ballots so flooded with excess candidates? Why does ALA do it this way, when no other professional association does it this way? Perhaps you can do a follow-up post about bullet voting. I am not sure I understand it well enough, but I have been led to believe that by “bullet voting” I am giving more weight to each vote that I cast by not casting the maximum number of votes. I do not that there are some groups in ALA which seem to use this concept to ensure that some of “their candidates” are elected to Council. I need to think some more about the approval voting concept. So, perhaps another post is in order.